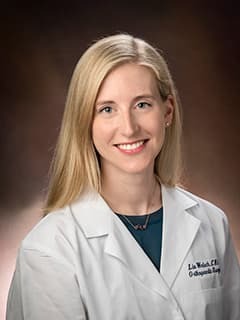 Lia W. McNeely, MA, MSN, CPNP, is the Quality, Safety and Value Advisor (QSVA) for the Center for Thoracic Insufficiency Syndrome (CTIS) and Division of Orthopedics at Children's Hospital of Philadelphia. McNeely LW, Staschak JC. Update on Pediatric Orthopaedic Sports Related Injuries: Recent Innovations for Pediatric Nurse Practitioner Practice [poster]. National Association of Pediatric Nurse Practitioner Conference; 2011 Mar 23-26; Baltimore, MD. McNeely LW. Orthopaedics for the Primary Care Provider. Presented at: Univsersity of Pennsylvania School of Nursing; 2017 Feb; Philadelphia, PA.
McNeely LW. Orthopaedics 101: The “Straight” Child. Presented at: Thomas Jefferson University School of Nursing; 2015; Philadelphia, PA.
McNeely LW. Orthopaedics for the Primary Care Provider. Presented at: Univsersity of Pennsylvania School of Nursing; 2015 Dec; Philadelphia, PA.